Note: Aussie Dollar Bingo no longer exists. The information in this review is for record purposes only and is no longer relevant. Welcome Package: $20 no-deposit free sign-up bonus, and up to 1000% matched bonus across your first two AUD deposits. Games: Live 75 and 90-ball bingo, pokies, video poker, keno and scratch cards. 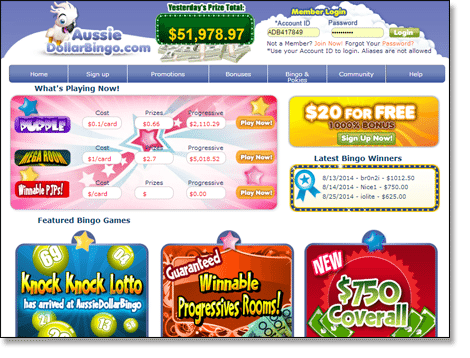 Aussie Dollar Bingo, part of The Bingo Affiliates Network, hosts some of the top online bingo games for Australians, along with video poker, keno, instant scratchie titles and 60+ popular classic and graphically-advanced Internet pokies, all playable directly from its website. No longer should bingo hold the ‘old ladies in retirement homes’ stereotype – with real online bingo communities, playing housie from the comfort of our own homes is something all Australians 18 years and older can now enjoy. Registration is free and is less than a two-minute process – you’ll be required to provide regular sign-up details such as your preferred email address, full name and date of birth, and you’ll need to create an alias and a password. Once you’ve completed your registration, you’ll be asked to verify your account via an email sent to the address used to sign up. Aussie Dollar Bingo offers a host of great bonuses, including free $20 in credit which requires no-deposit on the player’s behalf. Simply register online and the bonus will instantly be credited to your account upon verification. 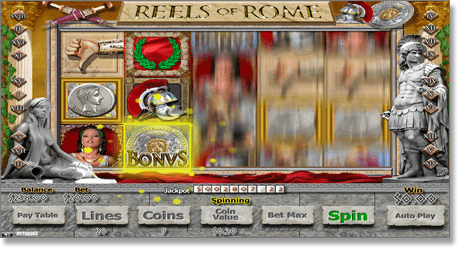 This bonus can be used towards any and all bingo games, as well as some pokies. Note: the no-deposit $20 promo acts as a Free Test Drive Bonus, is for fun only and expires 48 hours after being credited. It is considered play money, and any winnings generated are not able to be withdrawn. On top of a no-strings-attached $20 bonus, you can claim up to 1000% matched bonus over your first two real cash deposits – that’s 600% on the first and 400% on the second. Further to that, all deposits thereafter are matched at 300% – for as long as your remain a member at AussieDollarBingo. While the standard limit for deposits is $500 (which would mean a first deposit matched bonus of $3000), if you speak directly with a chat host or a network manager via email, you can get the limit increased to an agreed upon amount. For every bonus granted to players, 100% of that bonus is to be collected in Chat Bonus Bucks (Chat BBs); earn these BBs by playing entertaining chat games and partake in certain special offers/mini games within the bingo rooms. Once earned, players can exchange BBs for cash. Find out more about Chat BBs here. Daily extra bonus offers and specials for reloads are available (and constantly updated) each day. So if you’re planning on depositing some more cash, be sure to check out the current daily bonus on offer and take advantage. Once you’re a registered member, you can roam the site and use your $20 bonus cash to see what games you enjoy, the rooms which are most appealing to you, and the formats you like best. 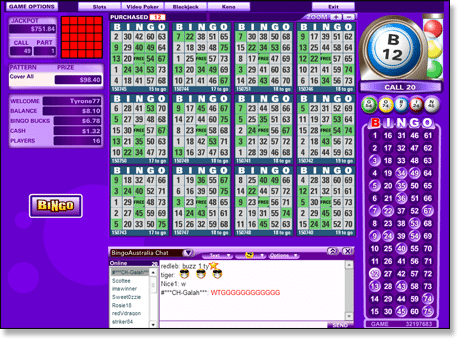 Aussie Dollar Bingo offers 90-ball bingo (what most Australians would be accustomed to playing), but it also hosts several 75-ball bingo games, the format of bingo chiefly played in the United States. Once you’ve decided where you wish to play and entered the room, you can purchase cards before the caller confirms no more cards are allowed to be bought. You’ll see before entering your chosen room how long to go before the game begins. Usually, if you buy a certain amount of bingo cards you’ll be rewarded with additional tickets at no extra cost (for example, buy 12 and get four cards free). You can either select ‘quick buy’ or choose your own tickets. You always have the option to refresh the current selection in exchange for new cards. The site also features a ‘pre-buy’ option, where players can take a look at all upcoming games and purchase however many tickets they desire for as many different rooms as they wish. The maximum number of tickets allowed per game is capped at 100 for 75-ball bingo and 48 for 90-ball bingo. Can I Play Bingo with Australian Dollars? Aussie Dollar Bingo and its sister site BingoAustralia.com are the first online bingo sites which conduct all their games, banking and financial transactions (deposits and payouts) in Australian currency (AUD). There is no need option to select AUD currency upon sign up if you are registering from within Australia, as it will automatically be the currency of choice. All transactions use the same SSL encryption technology utilised by Australian banks, personal information is kept secure, and no details are passed on to third-party companies. Many of the bingo games offered at Aussie Dollar Bingo incorporate big progressive jackpot prizes, some of which are guaranteed to be won that game, and others which climb and climb until won. Many of these jackpots are based on hitting bingo within a certain amount of calls (for example: filling your card within 53 called balls). Not only does Aussie Dollar Bingo offer housie, but the site also plays host to some great side games such as video slots and video poker, keno and scratchies (a.k.a. instants). Slot games are divided in to the following categories: progressive jackpot pokies, Parlay slots, full sized pokies, 3D slots and mobile pokies, with a combined total of more than 90 different titles. Play these games for real and practice money. 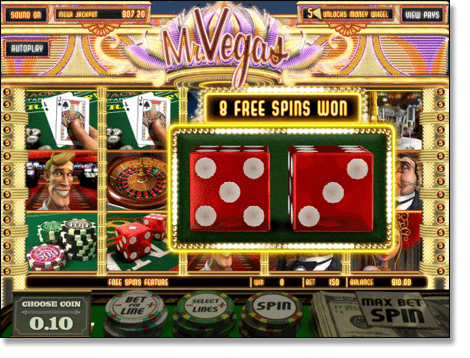 Video poker games include Bonus Poker, Deuces Wild, Jacks or Better, Joker Poker, Aces and Faces and multi-hands versions of many of the titles, too. Aussie Dollar Bingo offers a host of other incentives and promotions for all housie players including a unique Loyalty Program, High Rollers Room Events with large jackpots, Guaranteed Winnable Progressive Games, the Bingo Depositor Loyalty Stamp Card where you earn BBs for every deposit you make, Team Bingo Tournaments and Knock Knock Lotto (a lottery game played every Thursday where players select five number from 1-75 for a chance to win up to $100). Aussie Dollar Bingo’s VIP Loyalty Program rewards its faithful members by offering exclusive prizes, cash-back promos, increased daily deposit limits, additional birthday BBs and more. When you first sign up, you begin at the Yellow Opal level before moving up to the Orange Opal level by depositing on a minimum of three occasions and being a member for 15 days. There are seven Opal levels; the most prestigious being the Black Opal level which is by invite only based on certain criteria. For every friend you refer who signs up, deposits and plays at Aussie Dollar Bingo (or Bingo Australia – both companies are part of The Bingo Affiliates Network), you will receive $50 in withdrawable cash. Refer 10 players and that will be close to the easiest $500 you’ll ever make. Aussie Dollar Bingo uses the leading and most trusted and secure software in the online bingo industry – Parlay Entertainment (Parlay Games Inc); a Canadian-based developer of interactive bingo and other casino games, and powering sites around the globe since 1998. Players should feel comfortable knowing this software is specifically designed to keep personal information confidential with top-shelf server encryption technology, and that it also is constantly improving the quality of its gameplay and graphics. Monday – Thursday from 4.00pm – 2.00am AEST. Friday – Sunday from 10.00am – 2.00am AEST. Note: while Aussie Dollar Bingo and Bingo Australia are sister sites, you can still register accounts with both and trial all the different housie rooms and games. However, once you decide to credit your account with AUD currency (and should you win and want to cashout/withdraw), you will only be able to use one of your registered accounts for future withdrawals and deposits thereafter. Sign up at Aussie Dollar Bingo, get a feel for the rooms with a free $20 credit, and then get the most out of up to a 1000% matched two deposit bonus.